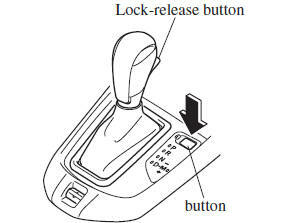 the brake pedal and hold in the lock-release button to shift (The ignition must be switched ON). be shifted freely into any position. the lock-release button to shift. The Sport AT has an option that is not included in the traditional automatic transaxle that gives the driver the option of selecting each gear instead of leaving it to the transaxle to shift gears. Even if you intend to use the automatic transaxle functions as a traditional automatic, you should also be aware that you can inadvertently shift into manual shift mode and an inappropriate gear may be retained as the vehicle speed increases. If you notice the engine speed going higher or hear the engine racing, confi rm you have not accidentally slipped into manual shift mode (page 4-50 ). indicated when the ignition is switched ON. 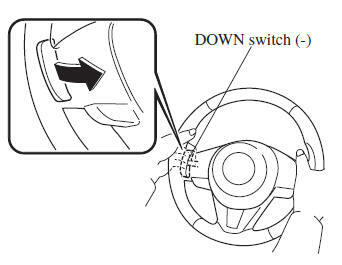 If one of the following actions is performed, the selector position is displayed for 5 minutes even if the ignition switch is in a position other than ON. 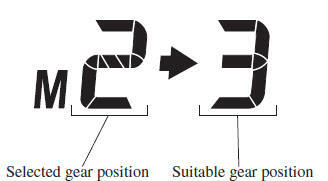 In manual shift mode, the “M” of the shift position indication illuminates and the numeral for the selected gear is displayed. The shift position indicator light in the instrument cluster illuminates. Refer to Warning/Indicator Lights on page 4-37 . The selector lever must be in P or N to operate the starter. Always set the selector lever to P and set the parking brake: Only setting the selector lever to the P position without using the parking brake to hold the vehicle is dangerous. If P fails to hold, the vehicle could move and cause an accident. Shifting into P, N or R while the vehicle is moving can damage your transaxle. Shifting into a driving gear or reverse when the engine is running faster than idle can damage the transaxle. In position R, the vehicle moves only backward. You must be at a complete stop before shifting to or from R, except under rare circumstances as explained in Rocking the Vehicle (page 3-50 ). If the engine is running faster than idle, do not shift from N or P into a driving gear: It's dangerous to shift from N or P into a driving gear when the engine is running faster than idle. If this is done, the vehicle could move suddenly, causing an accident or serious injury. Do not shift into N when driving the vehicle: Shifting into N while driving is dangerous. Engine braking cannot be applied when decelerating which could lead to an accident or serious injury. D is the normal driving position. From a stop, the transaxle will automatically shift through a 6-gearsequence. M is the manual shift mode position. Gears can be shifted up or down by operating the selector lever. Refer to Manual Shift Mode on page 4-50 . Active Adaptive Shift (AAS) automatically controls the transaxle shift points to best suit the road conditions and driver input. This improves driving feel. The transaxle may switch to AAS mode when driving up and down slopes, cornering, driving at high elevations, or depressing the accelerator pedal quickly while the selector lever is in the D position. 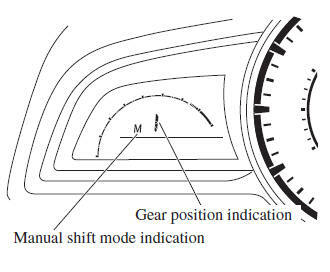 Depending on the road and driving conditions/vehicle operations, gear shifting could be delayed or not occur, however, this does not indicate a problem because the AAS mode will maintain the optimum gear position. 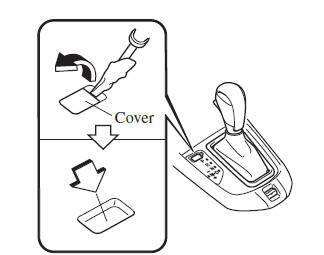 When the ignition is switched to ACC or the ignition is switched off, the selector lever cannot be shifted from P.
The ignition cannot be switched to OFF if the selector lever is not in P.
Remove the shift-lock override cover using a cloth-wrapped fl at head screwdriver. Take the vehicle to an expert repairer, we recommend an Authorised Mazda Repairer to have the system checked. Press the lock-release button with the button pressed. The manual shift mode gives you the feel of driving a manual transaxle vehicle by allowing you to operate the selector lever manually. This allows you to control engine rpm and torque to the drive wheels much like a manual transaxle when more control is desired. If you change to manual shift mode without depressing the accelerator pedal when driving in D range, 5th gear/6th gear, the gear will shift to M4/M5. 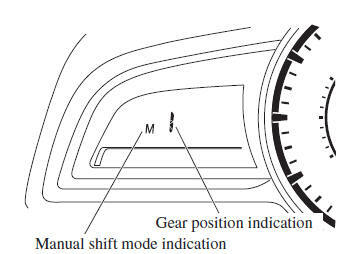 In manual shift mode, the “M” of the shift position indication in the instrument panel illuminates. If the gears cannot be shifted down when driving at higher speeds, the gear position indication will fl ash twice to signal that the gears cannot be shifted down (to protect the transaxle). If the automatic transaxle fl uid (ATF) temperature becomes too high, there is the possibility that the transaxle will switch to automatic shift mode, cancelling manual shift mode and turning off the gear position indication illumination. This is a normal function to protect the AT. 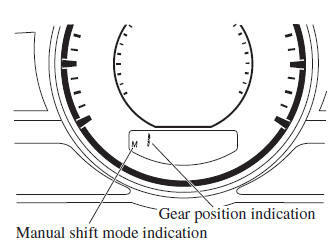 After the ATF temperature has decreased, the gear position indication illumination turns back on and driving in manual shift mode is restored. Manual shift mode is cancelled. You can shift gears up by operating the shift lever or the steering shift switches * . To shift up to a higher gear, tap the shift lever back once. Keep your hands on the steering wheel rim when using fi ngers on the steering shift switches: Putting your hands inside the rim of the steering wheel when using the steering shift switches is dangerous. If the driver's air bag were to deploy in a collision, your hands could be impacted causing injury. In manual shift mode, do not run the engine with the tachometer needle in the RED ZONE. When the engine rpm is high, a gear may shift up automatically to protect the engine. When depressing the accelerator fully, the transaxle will shift to a lower gear, depending on vehicle speed. is pulled rearward for a suffi cient amount of time. You can shift gears down by operating the shift lever or the steering shift switches * . To shift down to a lower gear, tap the selector lever forward once. 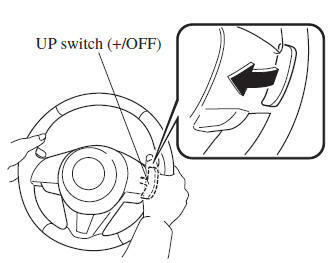 To shift down to a lower gear with the steering shift switches, pull the DOWN switch toward you once with your fi ngers. Do not use engine braking on slippery road surfaces or at high speeds: Shifting down while driving on wet, snowy, or frozen roads, or while driving at high speeds causes sudden engine braking, which is dangerous. The sudden change in tyre speed could cause the tyres to skid. This could lead to loss of vehicle control and an accident. When driving at high speeds, the gear may not shift down. When the selector lever is moved back while the vehicle speed is about 10 km/h (6.2 mph) or less, the transaxle is set in the second gear fi xed mode. The gear is fi xed in second while in this mode for easier acceleration from a stop and driving on slippery roads such as snow-covered roads. If the selector lever is moved back or forward while in the second gear fi xed mode, the mode will be cancelled. 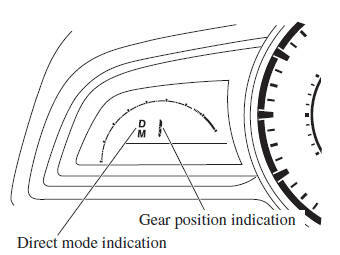 For each gear position while in the manual mode, the speed limit is set as follows: When the selector lever is operated within the range of the speed limit, the gear is shifted. The gear does not shift up while the vehicle speed is lower than the speed limit. The gear does not shift down while the vehicle speed exceeds the speed limit. If the vehicle speed exceeds the speed limit and the gear does not shift down, the gear position indication fl ashes 2 times to notify the driver that the gear cannot be shifted. When the accelerator pedal is depressed fully while driving, the gear shifts down. The gear also shifts down using kickdown while in the second gear fi xed mode. 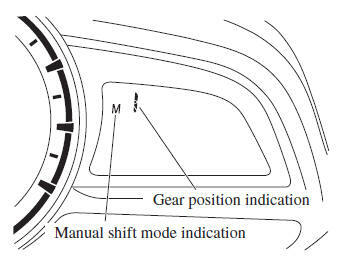 The gear shifts down automatically depending on the vehicle speed during deceleration. 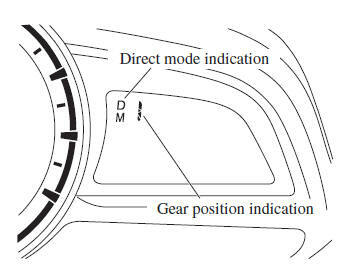 If the vehicle comes to a stop while in the second gear fi xed mode, the gear remains in second. 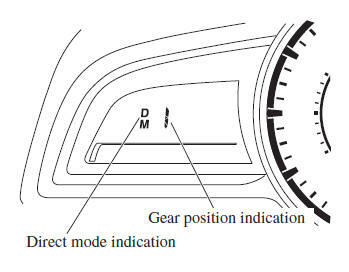 While in direct mode, the D and M indication illuminate and the gear position in use is illuminated. Direct mode is cancelled (released) under the following conditions. rearward for a certain amount of time or longer. The vehicle is driven for a certain amount of time or longer (time differs depending on the driving conditions while operating). The vehicle is stopped or moving at a slow speed. Shifting up and down while in direct mode may not be possible depending on the vehicle speed. In addition, because direct mode is cancelled (released) depending on the rate of acceleration or if the accelerator is fully depressed, use of the manual shift mode is recommended if you need to drive the vehicle in a particular gear for long periods. Do not let the vehicle move in a direction opposite to the direction selected by the selector lever: Do not let the vehicle move backward with the selector lever in a forward position, or do not let the vehicle move forward with the selector lever in the reverse position. Otherwise, the engine may stop, causing the loss of the power brake and power steering functions, and make it diffi cult to control the vehicle which could result in an accident. (Some models) The accelerator pedal may initially feel heavy as it is being depressed, then feel lighter as it is depressed further. This change in pedal force aids the engine control system in determining how much the accelerator pedal has been depressed for performing kickdown, and functions to control whether or not kickdown should be performed.